Normally when one goes off to college to study and play on a Division I football team, the workload from what students were used to in high school increases exponentially. For Campolindo graduate John Torchio, heading off to the University of Wisconsin to study and play football, it may prove to be more of a respite for the three-sport athlete. Sports have always been in John Torchio's blood. Torchio played multiple sports growing up - flag football, CYO basketball, swimming, soccer and volleyball though a family history may have directed him to a true love of football: "My grandfather and father both played quarterback at the University of California. It did have an influence in my playing football but there was never any pressure to play from my parents. I just had a love for the game." 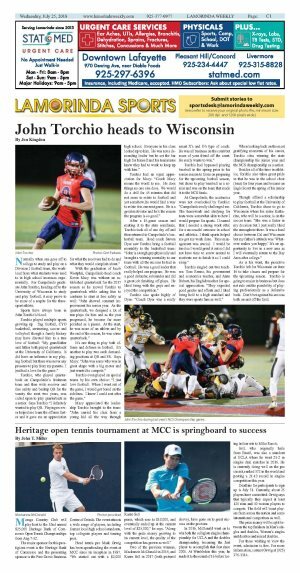 Torchio, who played quarterback on Campolindo's freshman team and then wide receiver and free safety and backup QB for the varsity the next two years, was called upon to play quarterback as a senior. Says Torchio: "I definitely wanted to play QB. Playing receiver helped me learn the offense faster and it gave me an appreciation for what the receivers had to do and what they would complain about." 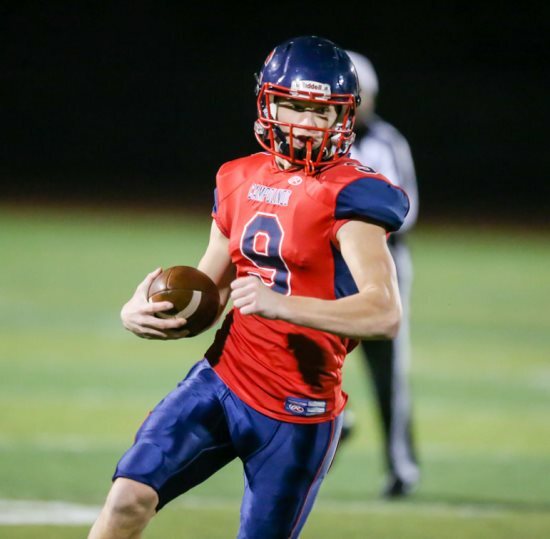 With the graduation of Jacob Westphal, Campolindo head coach Kevin Macy was without an established quarterback for the 2017 season so he moved Torchio to quarterback while asking him to continue to start at free safety as well: "John showed constant improvement his senior year. As the quarterback, we designed a lot of run plays for him and as the year progressed, he became far more polished as a passer. At the start, he was more of an athlete and by the end of the season, he was a true quarterback." It's one thing to play both offense and defense in football. It's another to play two such demanding positions at QB and FS. Says Macy: "John was some who was in great shape with a big motor and just wanted to compete." Torchio even played on special teams by his own choice: "I just love football. When I went out of the game, I would get bored on the sidelines. I knew I could rest after the game." Macy appreciated the leadership Torchio brought to the team: "John carried his class from a young kid all the way through high school. Everyone in his class looked up to him. He was not a demanding leader but he set the bar high for himself and his teammates knew they had to work to keep up with him." Torchio had an equal appreciation for Macy: "Coach Macy means the world to me. He does things no one else does. We would do a drill for 45 minutes that did not seem to relate to football and yet somehow, he would find a way to relate it to our next game. He is a great motivator and he's the reason the program is so good." After a 15-game season and making it to the state semifinals, Torchio took all of one day off and then returned to Campolindo's basketball team. Head coach Steven Dyer saw Torchio bring a football mentality to the basketball team: "John is a tough guy physically and brought a winning mentality to our team with all the success he had in football. He was a good leader that really helped our program. He was a good defender, rebounder and did a great job finishing off plays. He liked being with the guys and enjoyed the competition." Torchio also spoke highly of Dyer: "Coach Dyer was a really smart X's and O's type of coach. He was all business on the court but more of your friend off the court. He really wants to win." Torchio had bypassed playing baseball in the spring prior to his senior season to focus on preparing for the upcoming football season, but chose to play baseball as a senior and was on the team that made it to the NCS finals. At Campolindo, the academics were not overlooked by Torchio: "Campolindo really challenged me. The homework and studying for tests were somewhat akin to how I would prepare for sports. I learned that I needed a strong work ethic for a successful outcome in school and athletics. I think sports helped me get my work done. Time management was crucial. I would be tired so I would grind it out so I did not have time to screw around to motivate me to finish it so I could sleep." Torchio singled out two teachers: Tom Renno, his government and economics teacher, and Anne Hebert, his English teacher for special appreciation. "They expected good grades and efforts and I liked being held to a high standard and they were sports fans as well." When looking back on the most gratifying moments of his career, Torchio cites winning the state championship his junior year and the NCS championship as a senior. Besides all of the time in athletics, Torchio also takes great pride in that he was in the school choir (bass) for four years and became an Eagle Scout the spring of his junior year. Though offered a scholarship to play football at the University of California, Torchio chose to go to Wisconsin where his sister Katharine, who will be a senior, is on the soccer team: "She was a factor in my decision but I just really liked the atmosphere there. It was a hard choice between Cal and Wisconsin but my father's attitude was 'Whatever makes you happy.' It's an opportunity to live in a new area as I will eventually return to the Bay Area after college." As is his wont, the proactive Torchio left for Wisconsin on June 16 to take classes and prepare for the upcoming season. Torchio is going to major in business but does not rule out the possibility of playing professionally as a defensive back. Don't bet against his success both on and off the field. 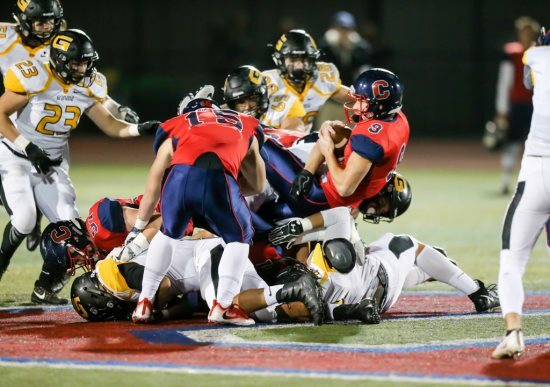 John Torchio during last year's NCS Championship game.